About 10 years ago, Porsche introduced the Cayenne, an SUV that was hated by purists but has been a financial boon for the company. The idea of a high riding Porsche is no longer heresy. 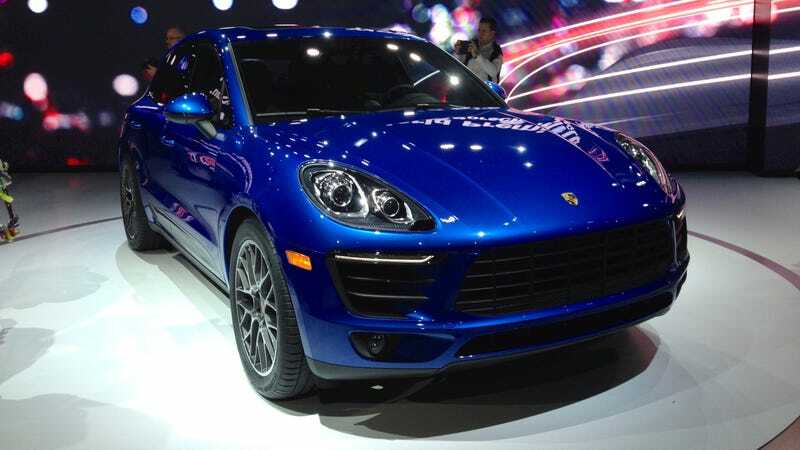 And that's why the time is right for this, the Macan. Known as Cajun (aka Cayenne Junior) for the entirety of its development cycle, the Macan takes what you know about the Cayenne and makes it smaller and cuter. In the looks department, the Macan shrinks and aggressive-ifys (That's definitely a word) the looks of the Cayenne. I'm not sure there are enough grille openings up front, but I digress. I like it a lot. Also dig those side blades. Like the Audi R8, they can be ordered in contrasting color to the car. Neat little design feature that you'll either love or hate. The interior looks great too, and it had the wheel of the 918. It might be Porsche's best. Under the hood, V6s are the name of the game. As we found out, the Macan will have either a 3.0 or a 3.6 under the hood, both turbos, but only the 3.6 will officially have the turbo moniker. The 3.0 will have about 340 horsepower, while the Turbo will get the full monty of 400. There is also a diesel, a 3.0 with 240 horsepower and a buttload of torque. And we're getting it. As far as luxury SUVs go, the base model won't even break the bank too hard. It starts around $49,000. The Turbo's a bit steeper at $72,000. Look, some may still see a Porsche SUV as heresy. I don't. They're a full line automaker now, and if they want to continue to grow, they need a small crossover to be competitive. That's just the way it is. And they want to sell 50,000 a year. I have no doubt that the road manners of the Macan will rival or exceed all of its competitors. That's a fantastic way to start.